Product prices and availability are accurate as of 2019-03-27 23:31:57 EDT and are subject to change. Any price and availability information displayed on http://www.amazon.com/ at the time of purchase will apply to the purchase of this product. Saddle up for a wild ride! The Jockey Hat Cookie Cutter will keep that noggin safe though! These cookie cutters are perfect for a Kentucky Derby viewing party or for a horse show. Purchase in 2 inch, 3 inch, and 4 inch sizes. 3D Printed with durable plastic. Please hand wash only. Colors may vary. 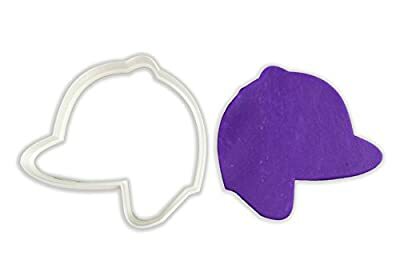 Our Jockey Hat Cookie Cutter is perfect for so many baking celebrations! Size: ALL SIZES SET Great for cutting cookie dough, fondant, gumpaste, and craft clay. Designed with a tapered edge for sharp, clean cuts.